‘Man’s best friend,’ doesn’t begin to say it all. Throughout the ages, from Cerberus, Hell’s three-headed guard-dog, to Lassie, who figured out that a 5/8” crescent-wrench was needed in order to get Timmy out of that collapsed mine-shaft in episode #76, we have always had a special relationship to these creatures. Even our language proclaims this. For example, ‘doggedly,’ means ‘with great determination’; we pay tribute to their willingness to work by saying that we are ‘dog-tired’; we even mark our pages of philosophy and great literature with ‘dog-ears’; and one of our utterances of profound despair, ‘doggone!’ comes from an ancient phrase meaning ‘my dog has run off’. Even the Pope’s best friend is his ‘dogma’. Now, suddenly, everyone’s a victim. In court rooms around the world, sniveling little shirkers are refusing to take responsibility for their actions. First, you had that lady spilling hot coffee on herself and suing the restaurant. This, in spite of the clear warning prominently printed on the bottom of the styrofoam cup which Ms. Butterfingers had turned upside-down to read. It said: “Our coffee is preheated at the center of the sun because our customers just love to be scalded.” And, now, at AFSouth you have people purportedly claiming to have been so-called allegedly ‘bit’ by dogs! This is impossible, since the proper passive participle of the verb ‘bite’ is not ‘bit,’ —it’s ‘bitten,’ and I think it’s high time some of these low-life whiners got a little education before they start mouthing off about Fido’s faults. Responsibility, friends, responsibility. Besides, why is it that these innocent widdle ‘victims’ always seem to be strolling along oblivious of their surroundings? Have I missed something? Isn’t this a military base? You mean to tell me that Joe Jungle Fighter over here doesn’t notice a stray mammal the size of an International Harvester threshing combine stalking him across an open parking lot? What does he think those lakes of rabid drool on the asphalt are, heat mirages?! If you ask me, these ‘victims’ are too worried about their rights instead of the rights of all of God’s creatures: ‘the right to bare arms, bare legs and bare anything else’. And if that little passage from the Magna Carta isn’t good enough for them, well excuuuse me! Fortunately, such incidents are getting fewer. The whiners are being intimidated, not so much by the vigilance of dog-lovers/protectors, but by the simple fact that the dogs are getting just a little too big to push around. 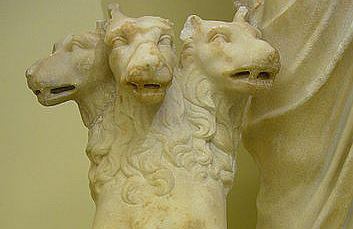 This is not due to genetic throw-back (see ‘Cerberus,’ above), as you might think. No, it’s totally natural: dogs eat people, dogs grow— it’s as simple as that. Also, the ferocity of the animals is increasing to the point where they can now be described as ‘much more than just cuddly’. This is because some of them are not just dogs. They are, in fact, lycanthropes —werewolves. I mean, who are all these mysterious people who park their cars around here when the moon is full and then disappear?! Where do they go at night? They don’t go anywhere; that’s the point. They stay here and turn into something else, that’s what! Personally, I look forward to the not-too-distant future. World peace will have broken out. (The Bad Guys may have made it through that formidable intersection down at the corner, but they didn’t get by the dogs! ‘Never have so many been bitten by so few so many times,’ will be part of our nostalgic vocabulary of freedom.) The rusted girders of AFSouth, jagged sentinels still strong against the crisp night sky. The full-throated voluptuous howl of the feral canine, singing above the silence —singing victory after the long cynanthromachy. We shall be long gone then. But they shall not be doggone. Still there. Still faithful.